NEW! Presidio's Engineering Selection Guide We created it to help you find the best capacitor product for your application. 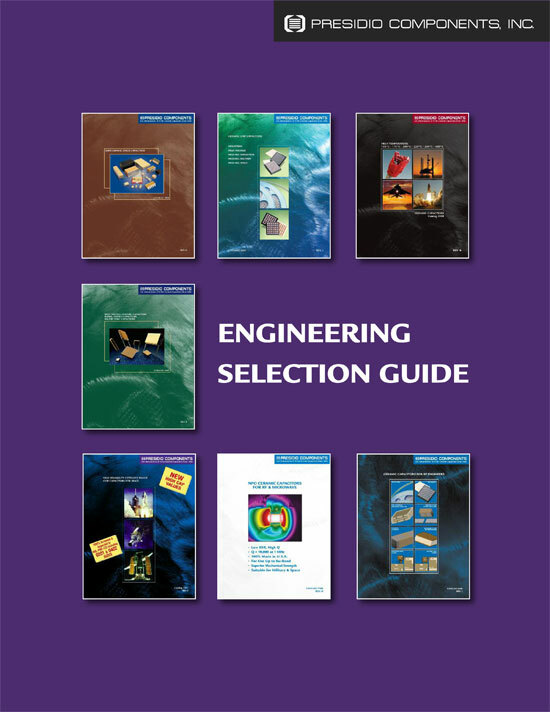 Click on the image below to download a PDF of the Engineering Selection Guide. Recommended product catalogs for various applications are included, with active links to each catalog. Note we regularly design new products to meet specific applications, including special voltage requirements, custom shapes, new types of termination, and even custom tests. If you can't find what you need, give us a call at (858) 578-9390. Our engineers can help you select or formulate the right Presidio product for your application. Presidio Components, Inc., has been an industry leader in the manufacture of ceramic capacitors since 1980. We provide ceramic capacitors for high quality commercial, military, and space applications. Our custom products include nonstandard part sizes and voltages, including high voltage, high temperature, high "Q", custom leads, cryogenic ceramics, negative and positive temperature characteristic ceramics and piezoelectric formulations. We have a series of patented microwave and radio frequency products including patented single layer and broadband DC blocking caps. Call Presidio at (858) 578-9390.